A viola running an international marathon in a Guinness World Record time has swelled the coffers of an inspiring scheme which brings together the Royal Birmingham Conservatoire and aspiring young musicians in South Africa. Inside the viola costume was Alistair Rutherford, who combines being a student at the conservatoire with enthusiastic membership of the Birmingham-based athletics club Birchfield Harriers. Alistair, otherwise known as the Running Viola, is trained by their senior men’s distance coach Dave Lawrence, and formed part of the Senior Men’s Team which won the 5000 metres race at the British Athletics League Premiership in August for the third time in a row. 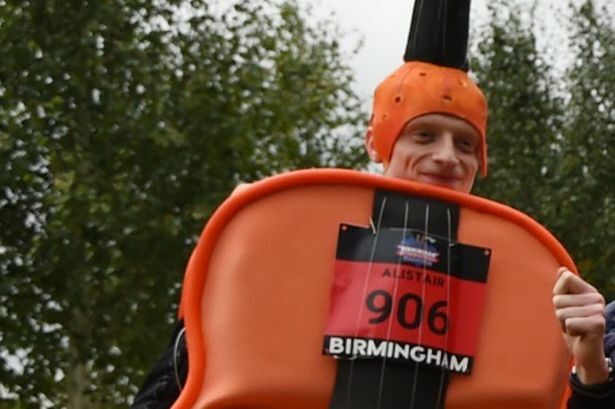 Wearing his custom-made viola costume, Alistair ran the Birmingham International Marathon last month in a time of three hours, 20 minutes and 33 seconds – beating the previous record by almost an hour. This achievement comes after Alistair broke the half marathon record earlier this year. Alistair hopes to raise at least £4,000 for the collaborative UK-South African project, Cape Gate MIAGI Centre for Music & Birmingham Conservatoire, from various letters within is how the sobriquet ARCO is derived (the recent accolade of “Royal” to the Conservatoire’s name would have made the derivation easier). More convincingly, the word “arco” is also a term for the technique of playing a stringed instrument with a bow. Thanks to Skype, 24 selected strings students aged between eight and 17 in South Africa are able to participate in weekly instrumental Skype lessons, given by academics, current students and alumni of Royal Birmingham Conservatoire. ARCO aims to provide the benefits and life changing inspiration of music to children in the most deprived of circumstances. As well as providing transformative music education activities, Conservatoire staff and students – including Alistair – have been acting as role models for vulnerable youngsters living in Soweto, a Johannesburg township deeply affected by poverty and crime. In fact, funds raised from Alistair’s world record triumph will enable his pupil, Njabulo Nxumalo, aged 17, to fly over to the UK in the next dew days, along with Kwanda Buthelezi, aged 13, and Mbali Phato, aged 12, to perform in the ARCO Concert on Saturday, November 18, as part of the second Cecil Aronowitz Viola Competition at the Royal Birmingham Conservatoire. Alistair’s marathon journey was streamed live to the ARCO youngsters, so they could cheer him on from the other side of the world, and 21-year-old Alistair, from Allerton in Liverpool, is overwhelmed. Louise Lansdown, head of strings at the Royal Birmingham Conservatoire, initiated the ARCO project in 2015. And the viola and South Africa will be much in evidence during the week after the ARCO recital, with the Royal Birmingham Conservatoire hosting the Cecil Aronowitz International Viola Festival. South African-born Aronowitz was a long-term collaborator with Benjamin Britten, co-founder of the Melos Ensemble, and violist with many of this country’s leading chamber orchestras. The week of masterclasses, workshops, talks and recitals comes to a climax on Friday, November 24, with the concerto final of the Cecil Aronowitz International Competition, bringing a link with another much-loved violist who sadly is no longer with us. Gwyn Williams was for many years a principal viola with the CBSO , and the Third Prize in this competition has been funded by his widow, Stephannie, in honour of his memory. All details on 0121 331 5909 or www.bcu.ac.uk/concerts.